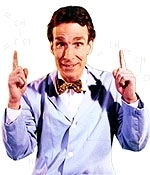 NOVEMBER 19--A late-night flower bed raid has prompted Bill Nye the Science Guy to obtain a temporary restraining order against a California woman whom the television personality appeared to have married last year. Nye, 51, last week secured the TRO against Blair Tindall, who admits that she poured weed killer in the garden of the Los Angeles home she once shared with Nye. According to a Los Angeles Superior Court filing by Nye (a copy of which you'll find here), Tindall, dressed in black, appeared in his backyard at 11:30 PM on Labor Day, and "fled on foot when I called her name." Tindall, Nye claimed, dropped two large bottles that had been "filled with some sort of solvent" and "may have been emptied on my garden from which I get food produce." In a second filing, Nye reported that the herbicide is "quite toxic" and claimed that he feared Tindall might have squirted him in the eyes with it had he been closer to her. For her part, Tindall, a 47-year-old writer, describes the flower assault as a "foolish, sophomoric act of poor judgment" that came in the midst of her having a series of personal and family problems. In a November 13 declaration, Tindall strongly denies being a threat to Nye, whom she accuses of "emotional cruelty." Nye, she stated, proposed marriage less than three months after meeting her in late-2005, and the pair appeared to have been wed last February in an impromptu ceremony officiated by Pastor Rick Warren (of "The Purpose Driven Life" fame). However, within weeks of the nuptials, Tindall noted, the newlyweds learned that "our marriage license was returned as invalid." It was then, she added, that Nye ordered her not to move into the Studio City home they had just purchased. The "faux marriage," Tindall added, left her heartbroken and distraught and led to the "dreadful moment" in the garden of "a man who no longer loved me."